Overfeeding. The Number One Cause of Tank Problems. The Number One Cause of Tank Problems. When you’ve serviced literally millions of gallons of aquariums for almost two decades you learn to identify issues almost on site. 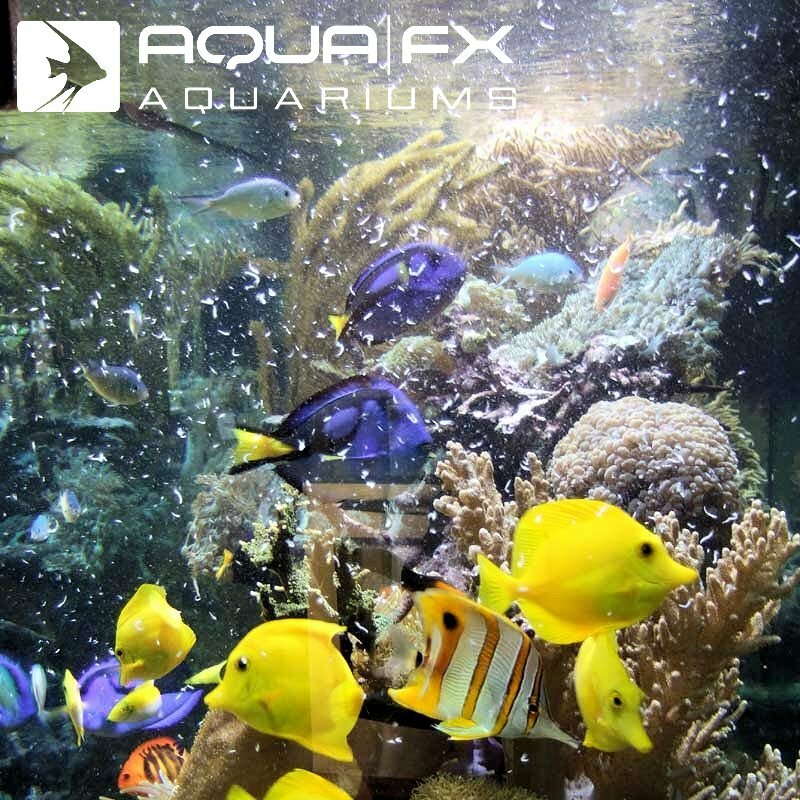 We get questions all the time from clients and hobbyists alike about different problems encountered in aquaria. The number one cause of most tank issues is… overfeeding. And it’s extremely easy to do. It’s understandable to a degree. Feeding time is one of the only ways we can interact with the fish, so for a lot of people it’s the highlight of the day and is easy to do too often. The fish get trained to look for food when we walk into a room, giving the impression of hunger. Finally, the idea of feeding too much may not seem detrimental, when in fact it can be dangerous. Accumulated uneaten food and fish waste pose a number of problems. First, they can result in lethal changes in the water chemistry. The breakdown products are toxic and can stress fish, making them prone to disease. Overeating, itself, can cause health problems. Finally, the aquarium can become very unsightly. High ammonia and nitrites – The protein in uneaten food and fish waste is broken down into ammonia and nitrites, which are extremely toxic to fish. Low oxygen levels – As organic material (uneaten food and fish waste) decays, it is an aerobic process, meaning it uses oxygen and produces carbon dioxide. This means there is less dissolved oxygen in the tank for the fish to use. Low pH levels – Just as the breakdown of organic material lowers the oxygen level, it also lowers the pH of the water because acids are produced during the process. Since each species of fish has an optimal pH range, those fish that prefer an alkaline pH are especially stressed. Fin rot – Fin rot is a condition in which the fins can develop a shaggy appearance. It most often occurs when fish are stressed, which is a common result of overfeeding. Fatty liver – Fatty liver, or hepatic lipidosis, is a disease more commonly seen in African cichlids and rainbowfish and is the result of overeating. It affects the function of the liver and can result in death of the fish. Algae bloom – Algae growth is one of the most common problems seen in aquariums. The number one cause is overfeeding. Unsightly blue-green and red algae multiply when there are large quantities of dissolved organic material, nitrates and phosphates in the water. Which is common when fish are overfed. Cloudy water – Cloudy water in either a aquarium is usually due to decaying organic matter. If due to overfeeding, the water will generally clear if the fish are not fed for 2-3 days (for most fish this is not a problem). Clogged filters – Filter systems are designed to remove the normal amount of waste materials and breakdown products from the water and not correct the excessive problems that occur with overfeeding. Uneaten food and waste materials can collect on the filters, continue to produce toxic products and clog the filters, thereby reducing their capacity to do the job. The reality is that cold-blooded fish digest food over longer periods of time then mammals do. This should be considered when feeding. Aqua FX Aquariums recommends feeding smaller amounts twice daily. In the wild, most fish do not eat large “meals” like we do, but are foraging and “nibbling” throughout the day. Feed the proper amount – in our experience, only feeding what is consumed in about 2 minutes has been the best practice. This gives the fish what they need to remain healthy and at the same time doesn’t create any maintenance problems in the future. Feed the proper food – Aqua FX Aquariums can provide our clients with an optimum diet based on the aquariums inhabitants. For the hobbyist, a Marine Fish Food Comparison Chart is a good place to start. Introduce a “clean up crew” – Invertebrates like crabs, snails and starfish can assist in eliminating some of the uneaten food that falls to the bottom of the aquarium. They are not a “fix-all” but can be helpful in removing food that falls to inaccessible areas of the tank that may be difficult to reach. They are imperative in a reef tank. Educate family members – In general, it is best if only one family member feeds the fish. If such a schedule is not possible, use a simple log or calendar to mark off when the fish have been fed to avoid duplicate feedings. Use proper filtration – When designing your aquarium we make sure to size your filtration units correctly; bigger is always better. We provide routine maintenance on your filtration system as well, to ensure it is operating at peak efficiency. Aquarium fish suffering from malnutrition due to a lack of food is virtually unheard of. Fish suffering from the negative effects of overfeeding such as ammonia poisoning or oxygen depletion is not uncommon. For the health and enjoyment of your fish please don’t overfeed.